Thursday, July 25 at 10 a.m. 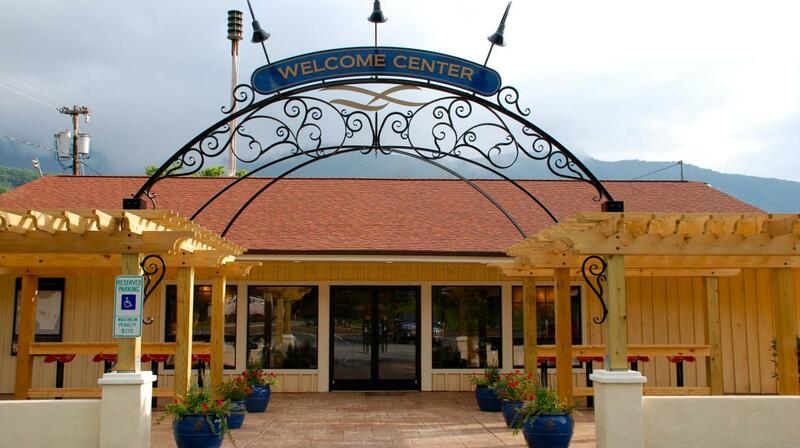 Instead of a simple cluster of brochure stands and a place to sit, visitors to the Lake Lure Welcome Center can expect a total immersion experience. and personality of the area," said Michelle Whitaker, executive director of Rutherford County TDA. filled with native plants, and pergolas where musicians can host performances or visitors can seek reprieve from the summer sun. Inside the building, an iPad bar features info on local dining in front of a Lake Lure-inspired boathouse façade; lodging info is housed in a “Blue Ridge Cabin Style” area with comfy fireside seating; and a miniature zip line display showcases area adventures and activities. The lodging info area has interactive displays, brochures, and comfy seating in front of a fire that invites them to sit and stay – much like visitors will find in many area lodging facilities. A film history display showcases info on Dirty Dancing, filmed in Lake Lure, and Last of the Mohicans, filmed in Chimney Rock, as well as other films. Finally, the “Map Room” includes a wall-sized timeline of local heritage visitors can experience, historic maps, area stories and folklore, and local culture, and will be complete with a three- dimensional topography map of the Hickory Nut Gorge. The grand opening is free and the general public is welcome. Rutherford County tourism stakeholders are encouraged to join in this landmark celebration. Rutherford County TDA is especially thankful to Sims Property Services for the exceptional construction of the facility, to Knight Strategies for the facility&apos;s extraordinary design, and Roundtable Construction&apos;s beautiful development of the exterior courtyard. For more information on the Lake Lure Welcome Center, please contact Adrienne Wallace at the center directly at 828-287-1220 or Adrienne.wallace@rutherfordcountync.gov. Experience these adventures and more when you travel to Lake Lure & the Blue Ridge Foothills in Western North Carolina. Home to Lake Lure, Chimney Rock, Rutherfordton, Spindale, Forest City and Bostic, there is a world waiting for you to explore, enjoy and love. We invite you to check out the view from our front porch. Plan your trip today at www.RutherfordTourism.com or find us on Facebook.